Do you have the misfortune of having a vehicle that is so old or damaged that it no longer runs? If the cost of fixing it exceeds the cost of getting a replacement vehicle, you already know that you can’t sell it via the normal avenues. You will need to find a way to get rid of it that hopefully won’t cost you too much money. But the truth is that if you live in the Gold Coast, not only is there a way to do this. But instead of paying money you will get paid money. Auto Wreckers Gold Coast @ Qldwreckers has made this possible. 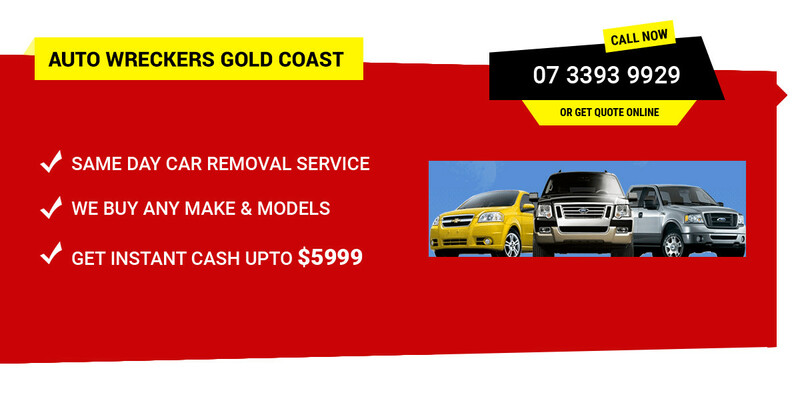 FREE Auto Removal in Gold Coast and get paid up to $9,999 cash for cars, 4wds, vans, trucks and Utes. The Gold Coast is a city in south eastern Queensland on the east coast of Australia. We are proudly offering our cash for car services throughout the whole region and working for happy customers. We have the biggest ratio of satisfied customers across the Gold Coast because we offer the same day scrap auto pickup service. Due to our wide-ranging network of buyers/auctions throughout Gold Coast, Gold Coast Auto Wreckers are able to offer you the maximum price for your car all the way through Queensland. Our proficient drivers are able to visit you to all towns and cities throughout Gold Coast, QLD to pick up your vehicle, and give you instant money on the spot. This is by far the fastest and easiest way to sell a vehicle whether it be used, old or scrap. And you won’t find a more reputable Cash for Car Company to do this for you then QLD Wreckers. Find out more about us. So, you have made the incredibly wise decision to go ahead and sell your vehicle to us here at QLD Wreckers. Here is how to get the metaphorical ball rolling. There are two different ways for you to get in touch with us. One of them is via the phone, by calling us at 0416 615 100. Or if you would prefer you can contact us by filling out this form that we have on the main page of our website. Either way if you can tell us the make, model, age and condition your car is in then we will get back to you fast with your quote. After that we will arrange with you for a time to come around to look at the car and pay you instant cash for it on the spot. Any time is fine and we can work around your schedule. Then before you know it you will have one less unwanted car and top cash in your wallet. This is the best way to sell a car that has ever been discovered. Your car isn’t running? If it were any other company that you were selling your vehicle to, you would have to shell out money in order to get the car over to their place of business. However, here at QLD Wreckers we will come to your place, or where-ever you want to meet us with the car. After having a closer inspection of the vehicle in question, we will then make a final offer. After you accept it, we pay you instant cash on the spot. Then we use our own car removal equipment to go about the task of removing the vehicle from its location. You don’t have to pay us anything for this service. There are no hidden charges either. All you have to do is sit back and let us do all the work! Top Cash paid for cars, 4wds, vans, Utes and trucks now! The team we have is comprised of the top experts and professionals in all of Brisbane. Tell them the make, model, condition your car is in along with its age. Our experts will then make an estimate on it using their highly valued skills garnered from many years on the job. And the bias toward paying top cash will be evident in the generous cash quote. Get a maximum cash for your junk vehicle today. We offer the estimations in 2 ways. Either you can get on phone by explaining the year, make, model and condition of the vehicle. However the most accurate quote can be calculated by the full assessment of the vehicle. If you find our competitor are paying more than us then we can beat all the competitive prices. However genuine requests will be considered. We are not limited to covering Bundall, Broadbeach, Labrador, Biggera Waters, Tallai, Coombabah, Molendinar and Helensvale which are the top ranked suburbs of Gold Coast. We try to cover all the suburbs of the Gold Coast and try our finest to offer the hassle free services to our customers. Are you an environmentally conscious individual? So are we! When we wreck cars we make sure that we recycle most of the vehicle that we are wrecking. This means that the steel that we recycle will be used in the future instead of steel that has been freshly made from recently mined raw materials. The mining process uses more energy than the recycling process. That means less carbon dioxide in the atmosphere. You don’t have to worry about your vehicle having any more negative impacts on the planet. So if you have a vehicle that needs selling don’t hesitate to contact local Auto Wreckers Gold Coast crew. Not to forget that we offer the best price in Queensland and always strive to serve better with our customers.